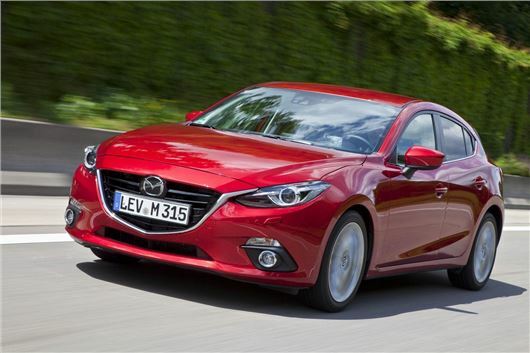 Mazda has announced the pricing and specifications for its all-new Mazda3 at the Frankfurt Motor Show. Prices for the 36 car range will start at £16,695 for the 1.5-litre Skyactiv-G and rise to £23,345 for the diesel 2.2-litre. The new line-up will boast five trim levels - SE, SE Nav, SE-L, SE-L Nav and Sport – and go on sale in the UK in early 2014. Mazda’s new family car will rival the likes of the Volkswagen Gold and Ford Focus, and will be sold in both ‘fastback’ saloon and hatchback body styles. Highlights of the latest generation model include Skyactiv engines including an all-new 1.5-litre petrol with 100PS, a 2.0-litre petrol with either 120PS or 165PS and a 2.2-litre diesel 150PS and 380Nm of torque. The diesel is the most efficient, with combined cycle economy of 72.4mpg and emissions of 104g/km. The 165PS petrol produces 135g/km and has an economy figure of 48.7mpg, while the 120PS and 100PS petrol engines have combined cycle economy of 55.4mpg and emissions of 119g/km. All figures are for the manual hatchback versions. Every model will feature Smart City Brake Support (SCBS) as standard, which will help reduce low-speed collisions by automatically applying the brakes if the driver fails to act. We’ve already had a chance to get behind the wheel of the all-new Mazda3 so for more information on the upcoming model click here. The pricing seems fine still quite a bit more expensive than the old model... nothing to cheer about. If the reliability matches the 2004 model then it will be a winner. My current car is the same model and nearly 6 years on it hasn't had even the slightest problem, despite being driven all over Europe over some really bad roads and hitting the odd pot hole. Most reliable car I have owned for past 40 years of driving. I am lining up the purchase of a Honda Civic but after seeing this new model, I may change my mind after test driving the Mazda 3.